Use: Voted the best automotive news column available: you need it. What it is: If you could have only one automotive feature, this should be it. At Wheelbase Communications, we’ve chosen to stay away from providing an automotive-news column until we could do it in a non-traditional way. And here it is: the Auto Sleuth. Our worldly gumshoe has his ear to the ground, digging up the latest news on everything from product launches and updates to names in the news. The column is solely driven by reader interest. 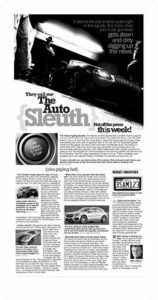 No boring statistics or auto-company pap here, just the straight goods peppered with the Auto Sleuth’s commentary and speculative, gossipy-style. Mac and PC print layout with separate text and art files for maximum work flexibility. Multi-platform layout opens with either Quark Xpress or Adobe Indesign. Layout is 8×16 inches (newspaper), but can be reconfigured by your designer to fit most spaces. About 850 words: separate text file included.